Sorry it's been so long since I last sent out a Newsletter. Life has been busy and not without some difficulties. There was concern where I work that we would have to close down around April/May this year. Much of my time and energy was devoted to dealing with this impending, potential closure. In the end, as is often the case in life, the worst did not happen and in fact we seem to have bounced up from 'rock bottom' and have had a larger influx of work than usual providing training and mediation for Universities. We have developed a strong working relationship with Brunel University in West London, our local university, and we have also just established a new contract with University of Plymouth in Cornwall, South West England to help them set up a Student Complaints Mediation Service. Nine people who have taken the name Muhammad - though sometimes the spelling is adjusted - are interviewed for this program. They include two white British born Muslims, a Black British born Muslim - all those interviewed were British - a woman who has the name Muhammad, a Muhammad with 'extremist' views and others. What is fascinating to hear are not only their very different views and lives and the stereotyped expectations of them that they experience through assumptions made on the basis of their name, but also their own different interpretations of Islam and the experiences and thoughts about the teachings of the Prophet Mohammed and how they relate to their own lives. While most speak of the views of the Prophet that all humans are equal irrespective of gender, social status, race etc. and the appeal of this as an ideal, the 'extremist' identifies with the alienation, anger and threats towards the Prophet by others when he was alive and the feeling, he assumes, of being rejected by others and his response to this that a forceful imposition of Sharia Law is needed as a way of bringing about Islamic ideals. It is interesting, as always, how we create our own individual stories based on what we read and hear and experience and project onto these and how religion can become such a powerful basis for these stories. Mohammed and Jesus and many other prophets were forcefully challenged and suffered violence and aggression and rejection. While some today relate more to the teachings they gave, and held fast to, even in the face of these difficulties, others feel angry and defensive and vengeful that their teachings should have been rejected so forcefully - leading them to act in ways that contradict the teachings they wish to assert. This has been a feature of the history of most, if not all religions. But it is not exclusive to our relationship with religions - How often do we act disrespectfully towards others because we feel they have not respected us or our beliefs, thus carrying out the very actions we would want to condemn? As I listened to the experiences they associate with being named Muhammad and being visually identified as Muslim, the interviewees discussed their difficult experiences of living in the UK following 9/11 in New York and the 7/7 bombings in London. While it is perhaps easier for me to have a sense of hope as I do not experience these difficulties, I was reminded of the fact that up until about 20-25 years ago, there was a similar prejudice towards people of Irish origin based on the terrorist bombings that were carried out on mainland UK as a result of the conflict in Northern Ireland. Such prejudice and fear rarely now exists in the UK towards Irish people and my hope and expectation is that that this will also disappear towards Muslims in the future. It would be preferable however if it could take less than 20 years. If we can acknowledge that the label of 'Muslim' or 'Irish' is not sufficient to justify the villification towards someone that can occur following an event such as a terrorist bomb, when the label is in no way the important or relevant aspect of the people who carry out such acts, then we can remain focused on the behaviour or action rather than waste energy and resources condemning a whole category of people. 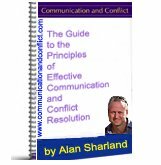 What we learn from our practice as mediators, is that the main communication and conflict resolution principle that applies to this is to challenge the behaviour not the person. We challenge the actions of an individual not 'who' they are. Looking beyond the name Muhammad, we see each person as an individual, influenced by, but not defined by their name. How can any name or label define any individual when each of us can be 'categorised' by hundreds of different labels, each with a different 'definition' and each definition varying according to who creates it. Our uniqueness transcends any labels that can be applied to us, including our name. I'm recommending this again this month as much of its content is highly relevant to the issue of labelling and conceptualising and how it often leads to our suffering. The Power of Now: A Guide to Spiritual Enlightenment - Eckhart Tolle often speaks of how, when we think of others in terms of 'concepts' or labels or categories and lose awareness that we are doing so, we also lose a sense of their individuality and humanity, sometimes to the extent we find ourselves able to kill others on the basis they fit into a particular category - 'enemy', 'terrorist', 'Muslim', 'Imperialist', 'Jewish', 'American' etc.